I have somewhat of an affinity for makeup palettes. No matter how many seem to accrue inside my makeup bag, I'm always trying to squeeze in just one more! 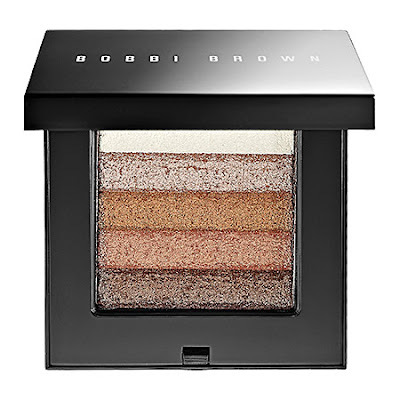 But one that gets permanent time and attention both in my bag and in my daily makeup routine is the Bobbi Brown Shimmer Brick Compact. Inside this lacquered black box are colors that work wonders not only on a variety of skin tones but in multidimensional, multifaceted ways. Though these compacts -- which come in a whopping five shades for a truly versatile look -- are primarily supposed to be used on the cheekbones for contouring and that healthy, natural-looking glow, this beauty chick loves to use them on my eyes instead! Currently making a long-standing rotation in my bag are the compacts in both Bronze and Pink. Bronze contains five gorgeous hues of brown, peach and cream, while Pink offers up five beautiful shades of pink, mauve and white, making it the go-to palette for summer! The colors in each are sparkly, glittery and truly pretty -- each lends just the subtlest hint of color that is buildable, blendable and leaves cheeks and eyes looking absolutely flawless. If these two palettes don't excite you, you can also choose from Apricot, Beige and Rose. The colors last for so long that it will be ages before you have to replace them! Any palette with "shimmer" right in the title deserves extra-long standing in this beauty chick's daily beauty regimen -- how about yours? Bobbi Brown Shimmer Brick Compacts retail for $42 each at sephora.com. Ooh, those look beautiful... way to get creative with the colors, too! :) I love shimmer as well! I just purchased the bronze one a few weeks ago after swooning for it for months. It was absolutely beautiful!!! I am in love and think that any shimmerbrick is a must have for the summer! beauty tyrant -- Definitely let me know which ones you pick up! divine blackness and the jet set girls -- Isn't the bronze one great? I think all the colors are so wearable.